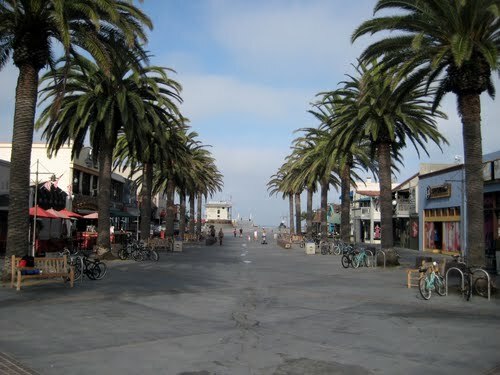 There are lots of things to do and lots of places to stay in Hermosa Beach California. The average temperature here in the summer is 74 degrees and 55 degrees in the winter. The beach itself is a clean beach with a pier, shops, restaurants and twenty parks. Great place to bring the family. There are four restroom facilities on the beach located at 22nd Street, 14th Street, The Pier and 2nd Street. Like playing volleyball? This beach has 71 courts! 37 of them are located north of the pier and the other 34 courts are south of the pier. The city maintains 23 of the nets while the others are maintained by court users. Or go directly to the Hotel page by clicking on these links. The Comedy and Magic Club is a fun place to go for entertainment. You can see Jay Leno here almost every Sunday night. Get here early for a good seat and parking. This place is a must see when visiting southern California, the food here is good too. There is a two drink minimum but has been expanded to include deserts. Located at 1018 Hermosa Ave. in Hermosa Beach. You can call 310-372-1193 for reservations and information. Fiesta Hermosa - Two stages featuring live music, one at the Main Stage on the pier and another in the Charity Beer & Wine Garden. This happens every Memorial Day and Labor day weekend each year. This is the largest arts and crafts fair in southern California featuring sculptors, jewelers, ceramicists, photographers and painters. Plenty of food options and a Kiddie Carnival! Wine Tasting at Uncorked - Over 600 wines from all over the world, this is a retail shop with unique wine accessories, gourmet treats, olive oils, gourmet cheese, custom gift baskets and Uncorked offers kraft beers, both domestic and imported. Located at 302 Pier Avenue. Call 424-247-7117 for more information. The Lighthouse Cafe is a mainstay in Hermosa Beach on Pier Plaza featuring food, great drinks and live music. It is the home of an exceptional jazz group known as Howard Rumsey's Lighthouse All-Stars. Located at 30 Pier Avenue, call 310-376-9833 for more information or visit their website at thelighthousecafe.net. The Hermosa Beach Playhouse is a 474-seat venue that presents a varied catalog of straight plays as well as musicals. Located at 710 Pier Avenue in Hermosa Beach California. Call 310-372-4477 for more information or visit their website at belasco.org.